Homeground coffee tasting blah lately? Maybe it's time to do this. 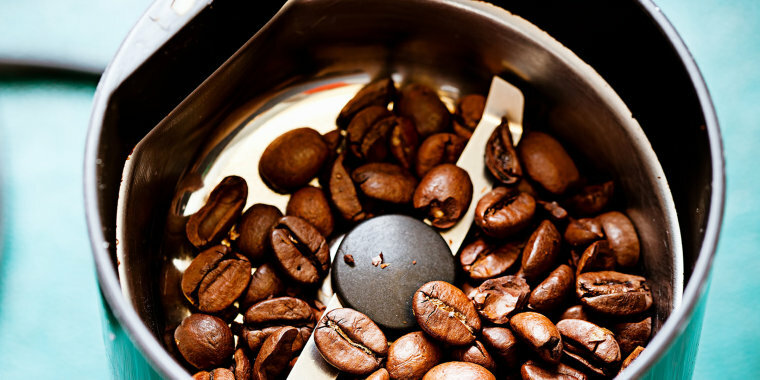 Coffee grinders are great for fresh-tasting coffee. But those fragrant beans leave behind an oily residue that, over time, goes stale or turns rancid and affects the flavor of the coffee. The same thing happens when you're grinding spices — and those oils can be mighty potent! When you notice oil on the lid or blades, simply grind some plain bread or raw rice in the grinder. The abrasion will clean the blades while the starch in either product will absorb the oils. Then just empty the crumbs, dusting with a small, soft brush if needed. This gives the grinder a good, quick clean in-between traditional washes. Usually, the removable parts of the grinder are top-rack dishwasher safe (using a gentle cycle), or you can wash them by hand in warm, soapy water. Remove ground particles from the lid and blades using a small, soft brush or cloth. Wipe the inside of the grinder lid and blades carefully with a damp cloth. Dry completely before replacing the lid. Finally, clean the base. Since the base contains the electrical components of the grinder, NEVER put the base in water. Just wipe it with a clean, damp cloth. Of course, you should follow manufacturer’s directions before cleaning anything. This article was originally published on Nov. 20, 2017.